Lanmei Airlines is expanding. The new carrier will add the Phnom Penh – Hanoi, Siem Reap – Ho Chi Ming City and Shihananoukville – Hong Kong routes on December 20, 2017 according to Airline Route. Lanmei Airlines (Cambodia) Co., Ltd. was founded on March 7, 2016, and commenced its first flight on September 29, 2017. The AOC was granted on August 15, 2017. The maiden flight of Lanmei Airlines by an Airbus A320 was from Sihanoukville to Macau and onward to Palau (above). The flight from Macau to Palau boarded 144 passengers and 177 ones from Macau to Sihanoukville. Named after Lancang-Mekong River, Lanmei Airlines’ logo looks like a peacock spreading its tails. Lanmei Airlines chooses peacock as logo because it symbolizes propitious totem in both oriental and western culture. The six feather of the wings-like logo represents the six Greater Mekong River countries who are the community of shared destiny & shared river. The logo also looks like a rotating aircraft engine, implying to supply new and steady thrust to these six nations. Copyright Photo: Michael Kelly (all others by Lanmei Airlines). This ex-Monarch Airlines Airbus A321-232, now painted for Cambodian LCC Lanmei Airlines as XU-919 (msn 3522, ex G-ZBAL) departed Dublin on delivery to Cambodia on the evening of December 8, 2017. This entry was posted in Lanmei Airlines and tagged 33522, A321-232, Airbus A321, DUB, Dublin, Lanmei Airlines, XU-919 on December 10, 2017 by Bruce Drum. American Airlines (Dallas/Fort Worth) is consolidating its operations at Los Angeles International Airport (LAX). With the last departure last night (Wednesday, November 5), American flights operated by US Airways ended operations at Terminal 3. All US Airways ticketing and check-in, gates, baggage and customer service operations began operations at Terminal 6 this morning (November 6). US Airways ticketing and check-in counters will be located on Level 2. US Airways flights will operate out of four dedicated gates – 60, 61, 62 and 63 – with convenient access to connections on flights operated by American Airlines at Terminal 4 through an underground connector. Shuttle service is also available to Terminal 4 and the Remote Terminal for American Eagle flights. American begins new nonstop service today (November 6) to Tampa, Florida (TPA). The airline announced last week the start of a second daily flight from LAX to London Heathrow (LHR), beginning in March 2015. American also began new, nonstop service from Los Angeles to Edmonton, Alberta, Vancouver, British Columbia, and San Antonio on October 2. American will continue to operate at Terminal 4. Customers traveling on American Airlines and US Airways should continue to check in for flights and conduct business with the airline operating their flight. American provides nearly 200 daily departures to 54 destinations in seven countries/territories from LAX. Copyright Photo: Michael B. Ing/AirlinersGallery.com. Boeing 777-323 ER N720AN (msn 33522) departs from Los Angeles International Airport. 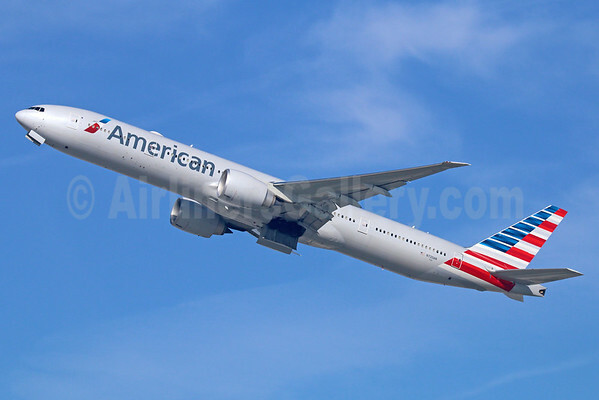 This entry was posted in American Airlines, US Airways and tagged 33522, 777, 777-300, 777-323, American Airlines, Boeing, Boeing 777, Boeing 777-300, LAX, los angeles international airport, N720AN, US Airways on November 6, 2014 by Bruce Drum. 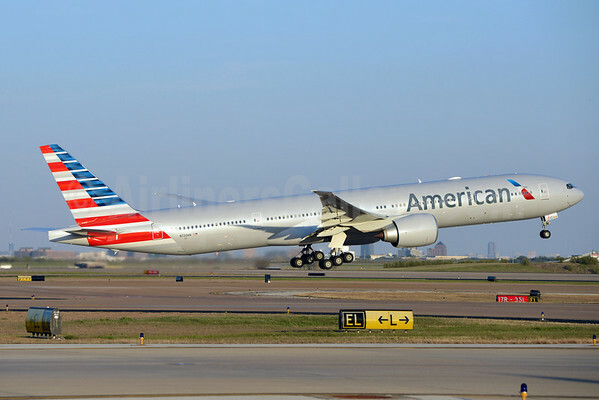 The new daily service between DFW and Hong Kong will be operated with a Boeing 777-300 ER, marking the first time American will deploy its flagship aircraft to Asia. The aircraft features a three-class cabin configuration with fully lie-flat seats in First and Business Class, international Wi-Fi, and more customer and cargo capacity than any other aircraft currently in American’s fleet. The new service between DFW and Shanghai will be operated with a Boeing 777-200 ER aircraft. American will be retrofitting its entire fleet of 777-200 ERs to include fully lie-flat Business Class seats, each with aisle access; new seats in the Main Cabin; in-seat entertainment; and international Wi-Fi capability. The new fully lie-flat Business Class seats on American’s 777-200 ERs will afford travelers among the largest living space of any 777 Business Class seat offered by any U.S. carrier. Departs DFW at 12:45 p.m.
Departs HKG at 1:30 p.m. Arrives at DFW at 4:30 p.m.
Departs DFW at 10:55 a.m.
Departs PVG at 4:50 p.m. Arrives at DFW at 6:10 p.m. These new routes are operated as part of American’s joint business agreement with fellow oneworld® alliance member Japan Airlines-JAL (Tokyo). Through oneworld member airlines and their affiliates, American’s customers have access to nearly 150 destinations within Asia. The service to Hong Kong will add a new destination to American’s international network, and the service to Shanghai complements American’s existing service from Los Angeles International Airport (LAX) and Chicago O’Hare International Airport (ORD). Copyright Photo: Brian Peters/AirlinersGallery.com. Boeing 777-323 ER N720AN (msn 33522) rotates on the runway at Dallas-Fort Worth International Airport (DFW). This entry was posted in American Airlines, JAL-Japan Airlines and tagged 33522, 777, 777-300, 777-323, American Airlines, Boeing, Boeing 777, Boeing 777-300, Dallas-Fort Worth International Airport, Dallas/Fort Worth, DFW, Hong Kong, Hong Kong International Airport, N720AN, Shanghai, Shanghai Pudong International Airport on June 11, 2014 by Bruce Drum.